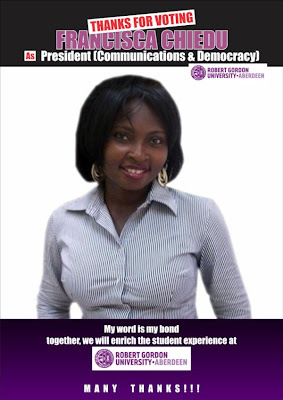 The RGU Student Elections for 2012 are over and our very own Francisca Chiedu was elected President for Communications and Democracy. Francisca was elected with 719 votes after 2 rounds. The Union reported on their posting that this year’s election was their biggest ever with a turnout of over 1920. This was an increase of 27.5% on the 2011 elections. It also broke the overall Robert Gordon University election turnout record! Well done to Francisca and to all the other candidates too.